It is hard not to notice the frenzy around holiday shopping season with all the Black Fridays, Cyber Mondays and other sales that have been happening all over the place. It is like all the humans on this planet get absorbed by the ego driven idea of consumerism during that time. It is neither good nor bad, it is just the way it is. There was probably a time when even you felt an uncontrollable urge to buy certain something, you are a human after all. How did we get here? When did it all start? Is there a way to stop being the slave of your own ego driven wishes? How to wish consciously without breaking the harmony created by Nature and for the things you wish for to actually happen? Some people may argue that the need to consume is deep in our human Nature and they would be right. However, when “what we want” goes far beyond what we need and can afford at the moment, our wishes turn us into slaves. When we lose conscious control of our wishes, it becomes much easier to manipulate us in doing what other people or groups of people want (e.g. corporations, political parties, religious groups, etc.). Enslavement of masses has been happening for a long time. It has been done by making people want what they don’t need and by linking goods that corporations produce to human subconscious desires. The ideas that were developed by Freud in the beginning of the last century took a somewhat unexpected turn and were used in order to control masses by using emotional desires that are inherent to human Nature (the history and the whole process of how it has been happening is described in detail in the 4-episode documentary “The Century of Self” by Adam Curtis, which you can find and watch online). There is really no reason to deny that we all are influenced by the informational stream promoting certain goods and services one way or another. When you drive on the road you see billboards, when you watch TV, you are exposed to advertisement campaigns, when you shop you are often manipulated by certain subliminal messages in the stores and so on. The problem is out there and the first step in dealing with any problem is to admit that it exists. When you are ready to acknowledge all the different ways you are being manipulated by those who know the Nature of human ego, you have a chance to take back the control. The only real weapon you have to fight those who have been trying to turn you into a slave is your choice of what to wish for. You can always choose where to invest your attention and energy. In order to stop being manipulated by those who use your ego to their own advantage, you have to take responsibility and start consciously wishing for what you truly want in your life. “Truly awakened person is not the one who locked him or herself in the cave to avoid the temptation, but the one who is consciously making choices to live an awakened life”. In other words, you need to find the middle way where “what you want” meets “what you need” and “what you can”. A very similar formula is used in psychology to help teenagers with choosing their professional field (so if you have a teenage son or daughter, this visual formula can help them discover what they want to do with their life). It is also not an accident that there are three parts to this formula. The concept of the Trinity is universal and can be found in many teachings (those who are into sacred geometry can also notice a familiar pattern in the visual formula below). 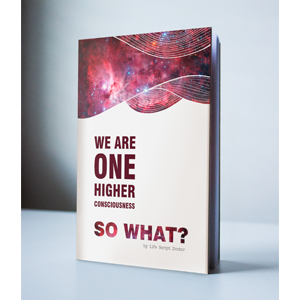 Where “what you want” is coming from – from your ego or from your heart, higher-self or Spirit? What kind of qualities your personality and mind has (or needs to acquire) in order to manifest your wish? Is your body ready to handle the need to manifest your wish? Answering these three questions can be the first step to understand the process of harmonious manifestation of your wishes. It will also help you see when you are being manipulated by others in what you should wish for. However, there is still a lot more to take into account if you want to know the physics behind wish manifestation as well as the tools that can help you achieve long-lasting results (see Beyond the Law of Attraction: The 9 Principles of Wish Manifestation). At the end of the day “what you want” should be coming from your higher-self or your Spirit. The potential that your Spirit brings to this world is one of the most valuable energy frequencies in this Universe (more at Wake-Up World article: How Your Numerology Birth Chart and Life Path Number Can Help You Realize Your Full Potential). Because of its value, there are many of those who want to have control over the potential you have. Thus it is your own responsibility to learn about your true wishes, make a choice where to invest your energy and act towards manifesting your dreams into reality. 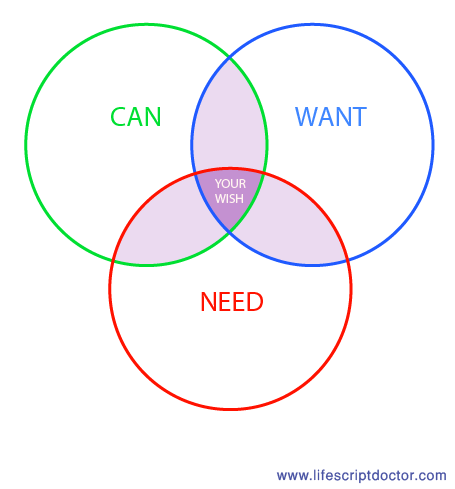 Using “want, can and need” formula can truly help you see what you should wish for. There are also various manifestation techniques (e.g. wish manifestation with “Glass of Water” ) to help you reach effective results when you wish consciously (for personal guidance and advanced practical knowledge check the “How to Manifest Your Wish” online session). Stay consciously aware of your wishes and follow your Spirit to bring to life your most sacred desires! Share the knowledge with a friend!